Real photo postcard of Wilson's Restaurant, 13136 Sierra Highway, across the street from the Sleepy Valley community in Mint Canyon, ~1950s. The attached bar (at right) is called The Oak Room. 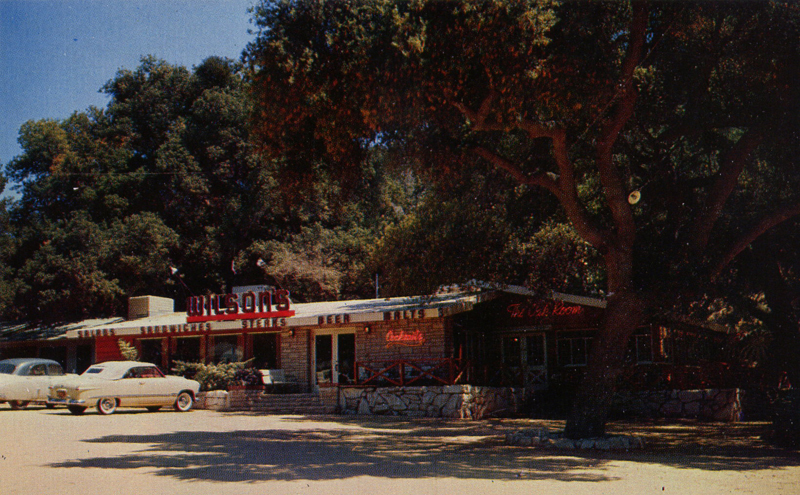 Wilson's was a popular roadside stop in the 1950s. Los Angeles County Assessor records show a 1951 construction date for the 4,744-square-foot building. Today (2010) it is home to the Holy Alamo Christian Foundation. Back of postcard states "WILSON'S RESTAURANT. In the scenic Mint Canyon - on Sierra Highway - Saugus, California. A delightful stop for the sportsman and traveler. Color photography by Jim Horn." Image courtesy of Charles Russell.